My fall decor is definitely minimalist. I really don't have room for much and I didn't want to put anything away to make room. It's called laziness. That means I have exactly three things. Okay, that was sort of a lie. I counted my table as one thing, but I actually made three changes to it. 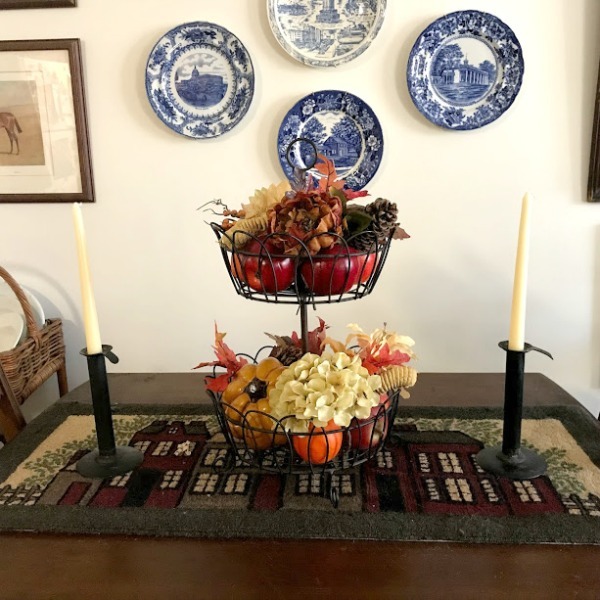 I replaced the glass candlesticks with black hog scraper candle holders, added a woven table runner, and filled my two tiered wire basket with an assortment of fall items. The ceramic bowl that was the centerpiece over the spring and summer has moved to the kitchen. I'll leave it the way it is until after Thanksgiving when I'll tweak it for Christmas. After Christmas I'll tweak it again and leave it for the rest of the winter. I love this ceramic pumpkin. It blends really well with the couch and is the only fall piece I have in the living room. 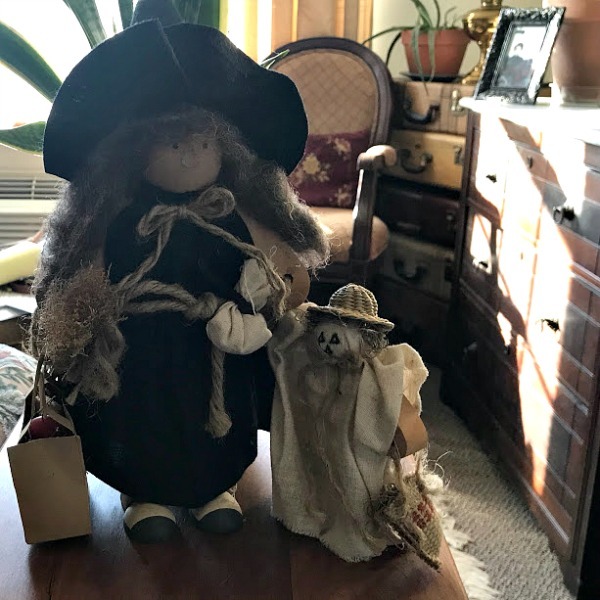 Every home needs a little Halloween and this cute witch and ghost are ready to trick or treat. Fall is such a wonderful season. 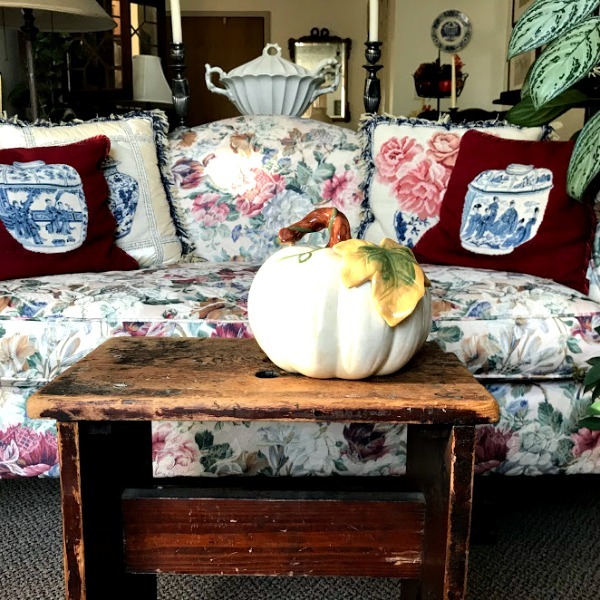 Warm days and cool nights seem to energize me, sending me out to crunch through fallen leaves before returning home to curl up in my cozy nest, where a wee bit of fall decor is just enough. I like just a touch of decor! Cute and easy to add and put away. I'm getting so I like less and less hassle except for Christmas. I really do go all out for Christmas! Very true. I too add pieces here and there and that's all; but yes, come C'mas is different. 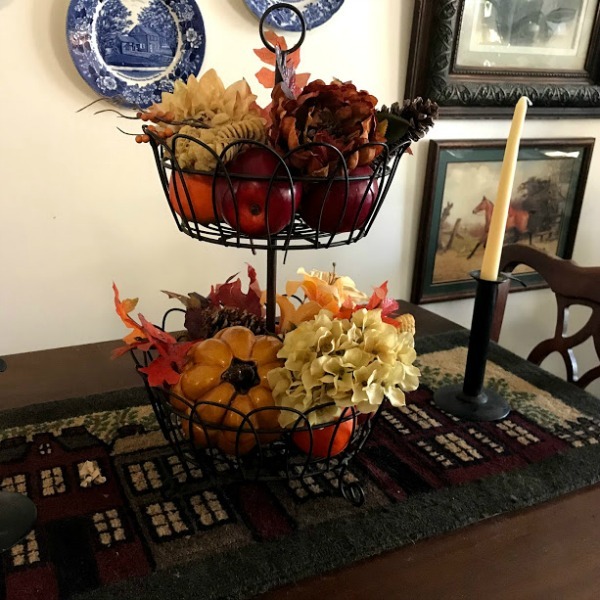 Beautiful small touches of Fall décor around your house. 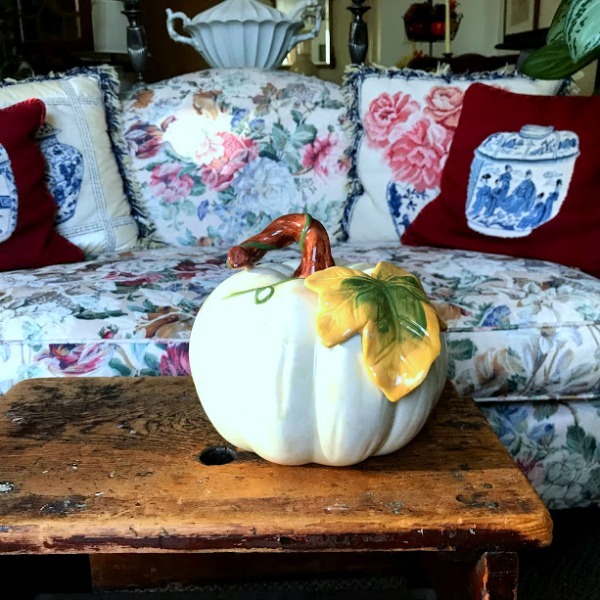 I love that big ceramic pumpkin and I was peeking at the gorgeous tureen in the background too. 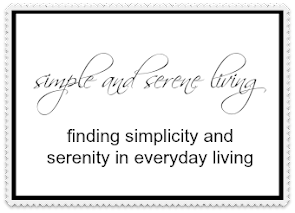 Love seeing snippets of your apartment! I notice not many live in apartments, so I love to see ones that do. I love your ceramic pumpkin! You are speaking my language! We've had a small pumpkin, the size of a baseball that has its tougne sticking out, for years. It's our only Halloween decor since the kids have grown. We love our home so much every day we don't want to undo to decorate for holidays! Awww love your little witch and ghost ready to trick or treat together. Just adorable. I really only did the outside of the house this year not too much on the inside with just trying to get the new place decorated. Have a great new week ahead Laura. Your ceramic pumpkin is my favorite! Your decorations are very pretty, Laura...I love the look of fall colors with blue and white dishes! Your ceramic pumpkin is lovely!